We are learning to solve division problems. Sometimes problems do not share into equal groups and there are some left over. In division these are called remainders. 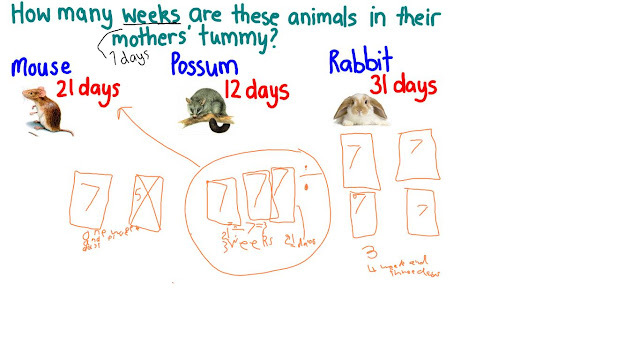 Our challenge today was to find out how many weeks babies were in their mothers' tummies. It was a challenge. Bella, Teague and Henrietta shared their learning on the interactive whiteboard. A cat is in the mums tummy for 63 days. A possum is in the mums tummy for 12 days. Caitlyn worked it out it was 1 week and 5 days. A challenge for you to try. A human baby is in the mothers tummy for 9 months. How many weeks is it in her tummy? Wow kidd-li-winks that is really clever thinking and clever maths! Well done Thomas you are working hard on your division and enjoy sharing it with us.